This is the second instalment of our Public Relations Manager, Peter Driver’s whistle-stop tour of Ireland, where he circumnavigated the country in less than five days, stopping off at some the most prestigious links golf courses along the way. We begin where we left off last month and following a 230 kilometre drive from the Ring of Kerry, we arrived at Lahinch Golf Club on the coast of County Clare. Lahinch has had outstanding designers from its inception through to modern times; Old Tom Morris, Alister MacKenzie and Martin Hawtree. Today, the custodian of the Old Course is head greenkeeper, Brian McDonagh, who has been at the club for 15 years and has been the head man since 2011. He has a team of seven permanent staff on the Old Course, supplement by a further six seasonals between April and October. “We run a Jacobsen AR522, which replaced the former model the AR250,” he said. We still had another 240 kilometres to travel, so shortly after 2.00 pm we set off in north-easterly direction heading for our overnight stop at Enniskillen, back in Northern Ireland, arriving at 6.20 pm. Dinner and an early night followed as we had an early start again in the morning. We checked out of the hotel at 7.30 am and were on the road shortly afterwards heading to the northern coast of County Donegal and Rosapenna Hotel and Golf Resort, situated among the sand dunes of the spectacular Sheephaven Bay. Arriving at 9.45 am the first person we met was Frank Casey Junior, the Director of Golf. Andy Campbell confirmed that his fleet of E-Z-GO RXV golf cars were behaving well and then it was outside to find Paul Travers, the Links Superintendent. Paul was down by the access road with his team of seven full-time employees and a contractor putting in a main drainage line to alleviate some local flooding issues. He joined the resort back in 2008 and manages a team of 12 staff which includes five part-timers in the summer months. Prior to this he was assistant course manager at Lough Erne during the construction and grow-in phases from 2005 until moving to Rosapenna in 2008. “This is by far the best greens mower on the market today; fuel economy is excellent and there’s absolutely no danger of the greenkeepers worst nightmare, an hydraulic oil leak on the green! To be able to control the frequency of cut is a huge advance and we’ve been experimenting with it to find the optimum for the greens here. Travelling in this part of northern Donegal is a delight; most of it following the Wild Atlantic Way, a tourist route that hugs the coastline and takes in the rugged cliffs of Malin Head, Fanad Head and the Slieve League. Our next port of call was Portsalon Golf Club, situated on the shore of the scenic Lough Swilly and its world-renowned beach, which was deemed to be the second most beautiful beach in the world by the UK’s Observer newspaper. Johnny Shields, Course Superintendent at Portsalon Golf Club, uses a Jacobsen GP400 ride-on triplex mower as his preferred option for maintaining the tees and approaches at the renowned golfing venue, currently ranked 23rd in the Golf Digest Ireland 100 top courses for 2015. 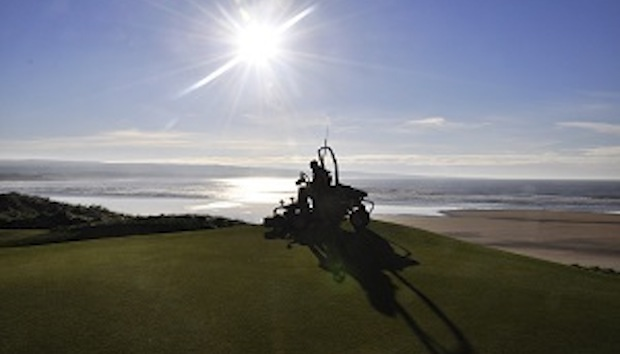 He manages a small team of three staff, who do a superb job of maintaining the 7,000 yard course, set among the sand dunes along Ballymastocker Bay with the Inishowen Hills beyond. We still had a couple of calls to make and get to our hotel in Ballymena, Northern Ireland some 200 kilometres away, so we said goodbye to Johnny and drove southeast to Letterkenny where we took the N13 towards Buncrana and a courtesy visit to North West Golf Club. Damian Docherty, the Links Superintendent, is very interested in purchasing an Eclipse 322 and Andy was delighted to provide him with anecdotes from our four-day road trip. We were soon back on the road and heading to Ireland’s most northerly golf club, located off Tullagh Point on the Atlantic edge of the Inishowen peninsula. Ballyliffin Golf Club was founded in 1947 and is a 36-hole mecca for the links golfer. Originally an 18-hole facility, the Glashedy Links was opened in 1995 to take the pressure off the overplayed Old Links. cotsman Andy Robertson is the experienced Links Superintendent and began his career at Thurso Golf Club in Caithness, where he spent five years learning his trade. In 1992 he headed south to Sunningdale in England, where he spent six years working on the New course, before successfully applying for the job at Ballyliffin in 1998. Andy heads a team of nine greenkeepers and a dedicated mechanic, who maintain the two courses. It’s a big job, so every man and every item of equipment has to perform to a maximum to ensure the golfing experience for the members and visitors. He is another convert to the Eclipse 322 and loves the quality of cut from the diesel-electric hybrid. “It’s quiet, frugal on fuel and therefore very cost-effective in terms of running costs,” he says. With the light fading fast, we bade farewell to Andy and headed via Derry/Londonderry back into Northern Ireland where we began our journey just four days ago. Our final destination for today was the Galgorm Resort and Spa, where we would overnight before returning to Belfast and our respective flights and ferries home. The next morning, and our final few hours in Ireland involved a meeting at Galgorm Castle Golf Club to discuss our continuing support for the Northern Ireland Open, before heading back to Belfast International airport and my return flight to London Stansted. The two hour wait for my flight gave me the ideal opportunity to reflect on this whirlwind visit. We visited 10 golf clubs in less than five days, eight of which were some of the most prestigious links courses in Ireland. We circumnavigated Ireland and travelled an incredible 1,440 kilometres (895 miles), met some lovely people but, most of all, came away convinced that the Jacobsen brand is flourishing on the links courses of the Emerald Isle.